When comparing a sea lion vs. seal you can spot the difference a few ways, one of which is the lack or presence of an ear. Seals lack an external ear flap whereas sea lions have an external ear flap that is visible. In addition, sea lions have a loud bark and walk on their large rear flippers versus seals more wriggle on their belly and have smaller rear flippers. Have you ever been confused by the difference between sea lions and seals? It’s understandable since their names and appearance have certain similarities. How can you tell the two apart? What are the differences between the two animals? In brief, sea lions are capable of walking on all fours, tend to be a little larger, and have discernable ear flaps. By contrast, seals flop and scoot around on their stomachs while on land and don’t have noticeable ear flaps. That’s the short answer, but let’s go over the two animals in more detail, as it will help distinguish the two from one another. Sea lions and seals are both part of the groups known as pinnipeds. Pinnipeds are those animals which spend a lot of time on both the shore of a landmass and in the ocean, and they include walruses along with sea lions and seals. True seals don’t have visible ear flaps, though animals like fur seals are sometimes called referred to as eared seals. True earless seals belong to the family Phocidae, and they are found throughout polar and temperate climates all throughout the world, including around the Pacific ocean. Fossil suggests they diverged into a separate family from other pinnipeds around 15-20 million years ago. Phocids, true seals, swim on their side, twisting their bodies and using their hind flippers to propel themselves through the water while the steer themselves with their fore flippers. Their bodies are built for more energy efficient swimming than sea lions, meaning that they can swim for longer periods of time. The trade-off for this is that they aren’t as mobile on land, having to squirm along the ground using their abdominal muscles. The bodies of seals are built to withstand pressure and minimal oxygen levels, letting them dive to impressive depths of 1000 feet and remain underwater for more than an hour. Seals have more oxygen in their blood than just about any animal on land, which enables these feats. 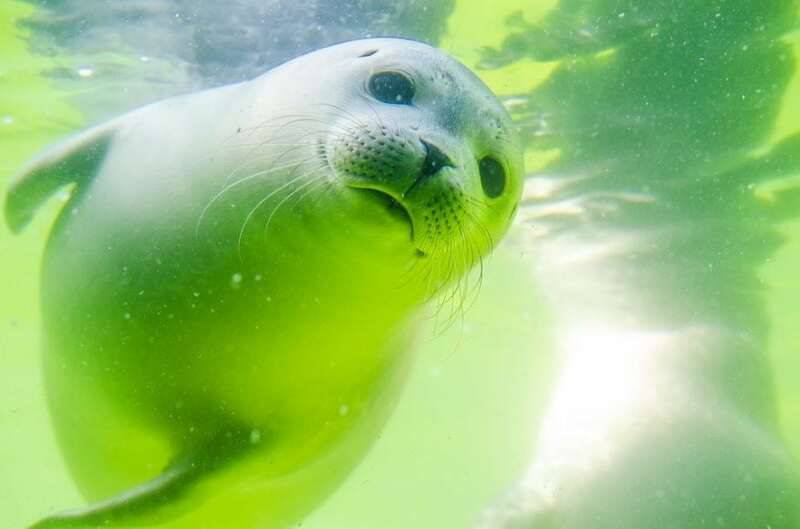 Before diving, seals get rid of all oxygen within their lungs, which helps them avoid a condition called “the bends” while diving, which is the formation of gas bubbles in the blood when rapidly ascending to the surface. Seals typically live in groups consisting of hundreds of individual during mating season. The large groups they mate in are an exception to their otherwise fairly solitary lifestyle. 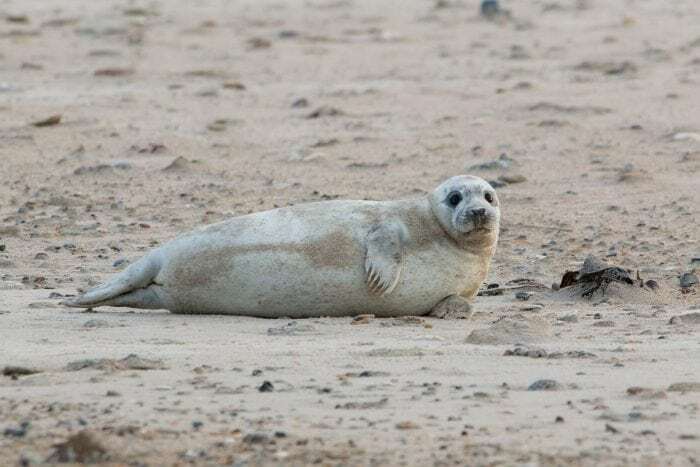 Seals tend to migrate back and forth between feeding grounds and breeding ground, and they may travel thousands of miles a year, like some other aquatic species. Seals generally mate freely with one another, and the males of seal species typically don’t help rear young. Seal pups are raised for between 4 to 5 weeks, at which point they can fend for themselves and their mothers leave them to mate once more. In terms of communication, seals tend to be quieter than sea lions. They communicate through quieter grunts and whines than sea-lions, who are known for their loud barks. There are at least 18 species of true seals, including the spotted seal, the grey seal, the bearded seal, the leopard seal, the northern elephant seal, and the Hawaiian monk seal. Sea lions are part of the family Otariidae, along with fur seals. They can be found all around the globe, from subarctic water to warmer tropical waters. They are more mobile on land than true seals, though they can’t swim for as long as true seals can. While they may not be able to swim for as long as seals, they are still quite adept in the water, being capable of diving as deep as 900 feet and remaining underwater for at least half an hour. Sea lions need to eat quite a bit of meat every day to thrive, sometimes consuming up to 50 pounds of squid or fish in a single day. Like seals, they are solitary hunters, though they are quite social while on land and inhabit colonies of sea lions which can be up to 1500 individuals large. Sea lions are a very sexually dimorphic species, meaning that there are substantial differences in size and appearance between the females and males of the species. In the case of sea lions, the males can be almost four times larger than females when adults. The general size of a sea lion will vary depending on its habitat. Sea lions who make their homes in warmer, tropical waters like the South American sea lion, tend to be smaller than those which make their home in colder waters. The colder the water is, the more blubber that the sea lions need to keep warm. Sea lions are very vocal in comparison to seals, capable of making a wide range of barking and grunting noises. This comes in handy during the mating season when the male sea lions will compete for territory (and thus breeding partners) by roaring and barking at one another, attempting to frighten each other off. They also engage in shoving matches, slamming into each other. Sea lions (and seals) go through a protracted pregnancy period, with the females carrying their young in utero for approximately 340 days. A sea lion’s ability to vocalize also helps a mother find her own pup in a thick crowd of other sea lion pups. The pup can recognize its mother by her distinct vocalization, and it likewise has its own unique vocalization that the mother can recognize. 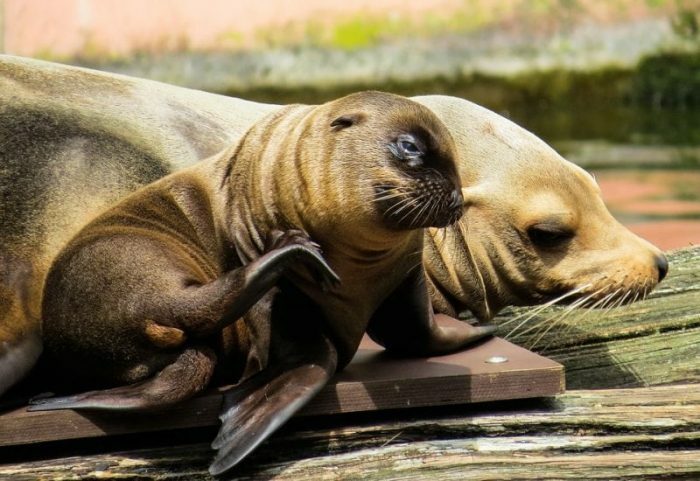 It’s important that a female sea lion is able to find her own pup because they often leave them for up to days at a time to go hunting for food, at least after the first two weeks after the pup is born. Apart from these periods of hunting a pup and its mother may stay by each other’s side for as long as two years before the young sea lion will venture off on its own. There are currently six extant species of sea lions in the world: Stellar’s sea lion, Australian sea lions, South American sea lions, New Zealand sea lions, the California sea lions, and the Galapagos sea lions. The Japanese sea lion went extinct in the 1950’s. A few of these species are considered endangered, with much of the damage to their species coming from climate change, which threatens many species around the globe. They share their Otariidae family with their fur seal cousins (again, not true seals). Sea lions and true seals are sometimes referred to as just “seals”, but there is a genuine difference between them. Seals have stubby front flippers, which means they have to scoot along on their stomachs when on land. Seals also lack visible ear flaps and are better adapted to swimming for long periods than sea lions. Sea lions are much more vocal than seals, have visible ear flaps, have more defined “legs” that allow them to walk on land, and are more social than seals. Previous Post« Previous Can Saccadic Eye Movements (SIRE Effects) Enhance Implicit and Explicit Memory?